My appetite for reading has kept up this summer. I think I’ve read more books this year than I ever have… I’m finishing my 20th book right now. I just can’t seem to stop and crave my time reading of every moment of the day. It’s my way to relax, to escape, to fill some quiet time at home and to reward myself for getting through my to-do list. I started the summer with these books, and have dug into some heavier novels and historical fiction since… with the exception of a lighter, fun read that I’ve been dying to share with you. Lucky for me, I write with Lisa at allParenting, so when Your Perfect Life was born, I felt as if a friend was having a baby. It’s been so fun to watch her debut it to the world! I’ve read a handful of book that have been written by friends or people who I know or work with and there’s a curious element to doing so because I tend to picture the author as the lead characters in the book… and it’s hard to let that go and just enjoy what I’m reading. But, my weird reading habits aside, I devoured Your Perfect Life and would highly recommend it. Liz and Lisa, who were previously of Chick Lit is Not Dead, co-wrote this story of two high school best friends, who accidentally switch lives at their 20-year high school reunion. Can you even imagine? Available on Amazon.com. I’m actually just two chapters from finishing this book, but I had to add it to this list because it is so, so interesting. A recommendation from my friend Molly, who appreciates a super-thick book as much as I do, Moloka’i is a historical fiction about a little girl who is sent to live in a leper colony in Hawaii in the 1850s. It took me a few chapters to get into it, but once I did, I was hooked. Not only was the story interesting and compelling, but the history of Hawaii and this period — before, during and after the time that the United States took possession — was new to me and kept me intrigued. Available on Amazon.com. One of my dearest friends told me, no less than six times, to read this book. And I didn’t listen. War books aren’t really my thing… or so I thought. Unbroken just as amazing as you’ve heard it is. It’s so good that there’s a huge blockbuster movie coming out this Christmas based on the story. It’s hard to simply touch on what this book is about, because it’s about everything. A memoir. A love story. A war story. A survival story. A story about friendship and dedication and perseverance and life. Be prepared, it’s gritty at times and if you’re like me, you’ll only be able to read a handful of pages at a time because it’s just so much to process. Available on Amazon.com. This book has been on my to-read list for a while and I’m not even sure where it came from, as it’s quite a departure from books that I typically read. However, it was worth the time and a great choice for a book to read while traveling. I was impressed with the flow of Defending Jacob, which skips back-and-forth in the lives of the characters, but does it flawlessly. It’s a book that rotates around the murder of a teenager, a father who is defending his son and the trial that surrounds it all. The elements of the parenting dilemmas in Defending Jacob drew me in and I loved how satisfied I was at the end, despite never really getting any resolution. Available on Amazon.com (it’s only $3 for Kindle right now!). Next up on my reading list is Sarah Jio’s Goodnight June. And, I keep hearing good things about Tell the Wolves I’m Home and Eleanor & Park, so maybe those will be next. You can find all of the books on my to-read list on Pinterest, as well as the other books I’ve read this year. I also wrote this article for allParenting earlier this summer: 10 Books to read poolside. And, in case you’re wondering, kiddie pools totally count. Psst! Amazon doesn’t pay me to recommend you buy your books there. It’s just a convenient place to link to give you more information on each book and where I happen to order books for my Kindle. Opinions are always my own. The end. 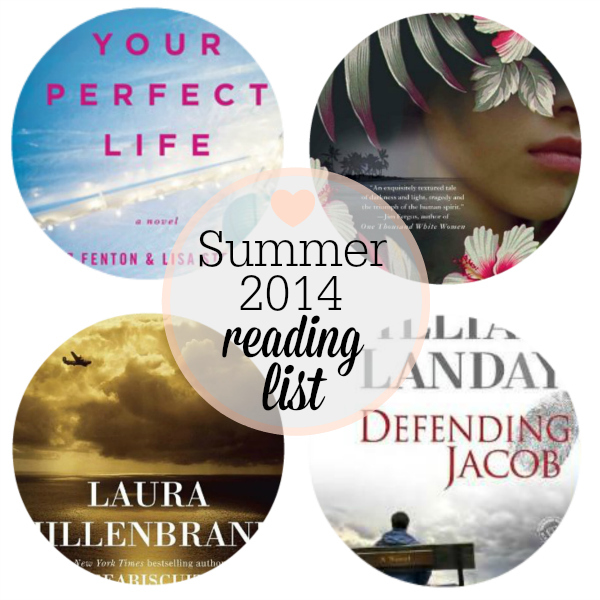 This entry was posted in Reading List and tagged 2014, Book Suggestions, Reading List, Summer on August 13, 2014 by Katie Kavulla.